About 10% to 30% adolescents are obese in India. The most dangerous concern, according to this study, is that as many as 60% to 70% of these will remain overweight / obese even in their adulthood. If obesity runs into adulthood, it may result in diabetes and other cardiovascular issues. One of the main reasons behind obesity among children is overfeeding them in the early years. The fat cells they consume get distributed all over their body. To top it all, sedentary lifestyles in cities make it worse for the child to lose the accumulated fat. There has also been a drastic change in children’s food habits. Today, children are susceptible to more junk, chemically-treated food than the goodness of home-cooked wholesome meals. What happens is: consumption of these trans-fatty products and lack of physical activity lead to an unprecedented supply of calories that never actually get used. Watching television and sitting in one place with gadgets for hours together majorly contribute to obesity among children. An obese child is often teased and bullied in school. This leads to low self-esteem and depression, among other problems. Junk food has been proven to cause depression. Being overweight can also cause breathing problems. And this, in turn, causes the child to shun exercise. And this becomes a vicious circle. In urban India, usually both parents of a child work. So, they hardly get to look after their child’s physical activity and food. Nuclear family children have nannies, but they do not provide the holistic care a stay-at-home parent does. Unfortunately, most modern working parents end up feeding their children fast food. They also eat out too often. They gift their children with television, video games and computers. So, the child depends on gadgets for his entertainment and doesn’t socialise or care to play in a real playgrounds. Even if the child lives in a joint family, the grandparents pamper them with sweets and chocolates. Nobody ever encourages them to play outside with other kids. That’s where the crux of the problem lies. 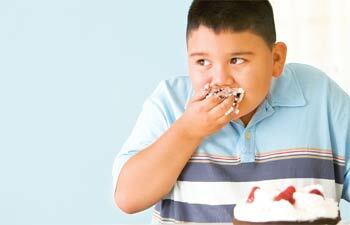 A recent study found out that obesity among children lowers their cognitive function. As childhood obesity spills over into adulthood, the obese person becomes prone to high blood pressure, heart disorders, diabetes and asthma, to name a few. Being overweight can cause a girl child to arrive at puberty earlier than usual. Also, it contributes to uterine fibroids and menstrual irregularities later. Obesity makes children prone to metabolism syndrome, sleep apnea, low self-esteem and body dissatisfaction. The more serious long-term dangerous of obesity include gall bladder thyroid, Type II diabetes and several types of cancers. Introduce your child to other forms of entertainment that include physical activity. Encourage them to eat home-cooked meals by explaining why it’s good for them. Talk to them about the ill effects of overeating, junk food and low physical activity. May be you can show them this fun health poster. It is sure to inspire them! Tell them about the weight loss benefits of these superfoods. Do not ‘endorse’ their obesity by calling it cute and chubby. In truth, it’s only patronising. Ask them to ditch television while eating their meals. Explain them the benefits of regular physical activity and the dangers of obesity in their adulthood. Coca Cola, Pepsi and other such soft drinks are the biggest culprits of obesity in children. Tell your child what kind of chemicals, fats and sugar they contain and the bad effects of those chemicals on their health. Inspire them to actively participate in sports and not focus on academics alone. Tell them they can transit from fat to fit, by eating right and being physically active. Does your kid need glasses to read?